For quantitative determination of bilirubin and evaluation of drug effects on bilirubin metabolism. • Sensitive and accurate. Detection limit 0.16 mg/dL bilirubin in 96-well plate assay. • Simple and high-throughput. The procedure involves addition of a single working reagent and incubation for 10 min. Can be readily automated as a high-throughput assay in 96-well plates for thousands of samples per day. BILIRUBIN is one of the degradation products of hemoglobin formed when red blood cells die. Bilirubin exists in the insoluble unconjugated form (also indirect bilirubin), or soluble glucuronide conjugated form bilirubin (also direct bilirubin). Conjugated bilirubin moves into the bile canaliculi of the liver and then to the gall bladder. When stimulated by eating, bile (including the conjugated bilirubin) is excreted into the small intestine, where bilirubin is converted into urobilinogen. 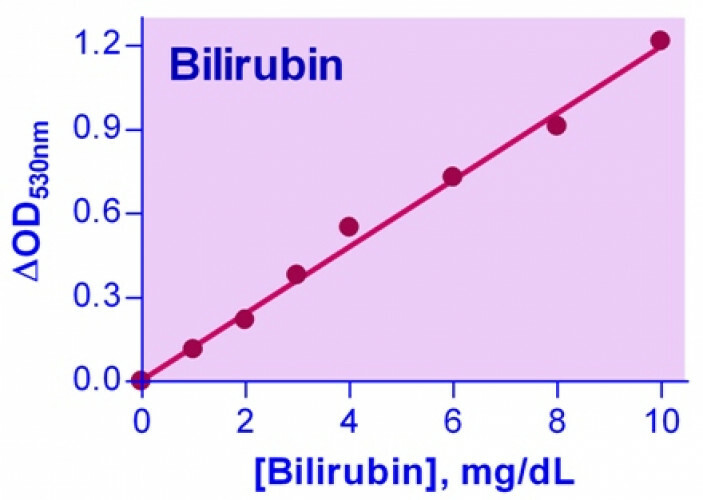 Bilirubin is a key diagnostic indicator. High levels of bilirubin result when too much hemoglobin is broken down or the removal of bilirubin does not function properly. The accumulation of bilirubin in the body causes jaundice. Simple and automation-ready procedures for quantitative determination of bilirubin find wide applications in research and drug discovery. BioAssay Systems’ bilirubin assay kit is designed to measure bilirubin in blood specimen in 96-well or cuvette formats. The improved Jendrassik-Grof method utilizes the reaction of bilirubin with diazotized sulfanilic acid, in which a red colored product is formed. The intensity of the color, measured at 510-550nm, is an accurate measure of the bilirubin level in the sample. 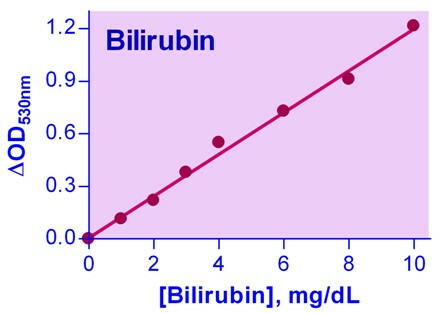 Total bilirubin is assessed using caffeine benzoate to split bilirubin from the unconjugated bilirubin protein complex. Applications For quantitative determination of bilirubin and evaluation of drug effects on bilirubin metabolism. References Assay: Bilirubin in Mouse plasma (Pubmed). 2. Okura, H et al (2010). Properties of hepatocyte-like cell clusters from human adipose tissue-derived mesenchymal stem cells. Tissue Eng Part C Methods. 16(4):761-70. Assay: Bilirubin in Serum Mouse (Pubmed). 3. Zhang, Z et al (2010). Preclinical assessment of simultaneous targeting of epidermal growth factor receptor (ErbB1) and ErbB2 as a strategy for cholangiocarcinoma therapy. Hepatology 52(3):975-86. Assay: Bilirubin in Rat blood (Pubmed). 4. Park, SW et al (2011). Cytokines induce small intestine and liver injury after renal ischemia or nephrectomy. Lab Invest. 91(1):63-84. Assay: Bilirubin in Mouse plasma (Pubmed). 5. Sirica, AE et al (2008). A novel "patient-like" model of cholangiocarcinoma progression based on bile duct inoculation of tumorigenic rat cholangiocyte cell lines. Hepatology 47(4):1178-90. Assay: Bilirubin in Rat serum (Pubmed). 6. Nedredal, GI et al (2009) Optimization of mass transfer for toxin removal and immunoprotection of hepatocytes in a bioartificial liver. Biotechnol Bioeng.104(5): 995?1003. Assay: Bilirubin in Human tissue (Pubmed). 7. Beppu, F et al (2009) Single and repeated oral dose toxicity study of fucoxanthin (FX), a marine carotenoid, in mice. J. Toxicol. Sci. 34(5): 501-510. Assay: Bilirubin in Mouse plasma (Pubmed). 8. Holt, MP et al (2010). Exacerbation of acetaminophen-induced disturbances of liver sinusoidal endothelial cells in the absence of Kupffer cells in mice. Toxicol Lett. 194(1-2):34-41. Assay: Bilirubin in Mouse blood (Pubmed). 9. Siciliano, A et al (2011). Abnormal modulation of cell protective systems in response to ischemic/reperfusion injury is important in the development of mouse sickle cell hepatopathy. Haematologica. 96(1):24-32. Assay: Bilirubin in Mouse blood (Pubmed). 10. Vinchi, F et al (2008) Hemopexin Prevents Endothelial Damage and Liver Congestion in a Mouse Model of Heme Overload. Am J Pathol. 173(1): 289?299. Assay: Bilirubin in Mouse serum (Pubmed). 11. Hyvelin, JM et al (2010). Hemin prevents in-stent stenosis in rat and rabbit models by inducing heme-oxygenase-1. J Vasc Surg. 51(2):417-28. Assay: Bilirubin in Rat blood (Pubmed). 12. Akachi, T et al (2010). 1-methylmalate from camu-camu (Myrciaria dubia) suppressed D-galactosamine-induced liver injury in rats. Biosci Biotechnol Biochem.74(3):573-8. Assay: Bilirubin in Rat plasma (Pubmed). 13. Vera, T, Stec, DE (2010). Moderate hyperbilirubinemia improves renal hemodynamics in ANG II-dependent hypertension. Am J Physiol Regul Integr Comp Physiol. 299(4):R1044-9. Assay: Bilirubin in Mouse blood (Pubmed). 14. Fu, YY et al (2010). Hyperbilirubinemia reduces the streptozotocin-induced pancreatic damage through attenuating the oxidative stress in the Gunn rat. Tohoku J Exp Med. 222(4):265-73. Assay: Bilirubin in Rat plasma (Pubmed). 1. Sekiya, S, Suzuki, A (2011). Direct conversion of mouse fibroblasts to hepatocyte-like cells by defined factors. Nature 475(7356):390-3. Assay: Bilirubin in Mouse plasma (Pubmed).